Before the season started, I made some predictions about how the four factors would change for the Atlanta Hawks this season. I'm not interested in evaluating those predictions this early* in the season but, in the first of a recurring series, let's track how the Hawks are performing relative to last season's 53-win team. *Not least of which because, according to John Hollinger's power rankings, the Hawks have played the league's fifth-easiest schedule thus far. Granted, the end of season power rankings at the Basketball-Reference.com Blog in April ranked the 2009-10 Hawks schedule the sixth-easiest in the league. 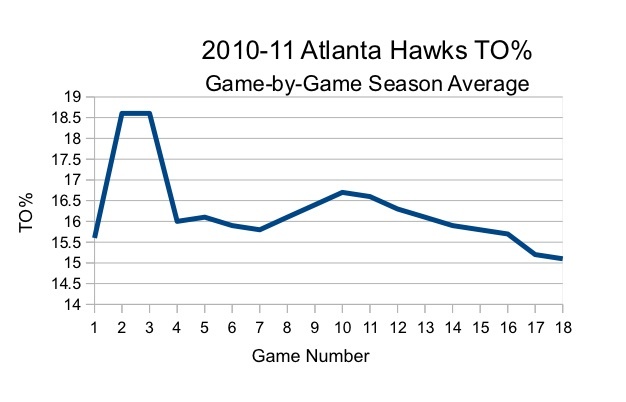 Unsurprisingly, the Hawks haven't been able to match last season's offensive efficiency. Then again, they don't have to do so to remain a good team. They've declined only to fifth in the league as improved shooting from the field and more frequent trips to the foul line have mostly compensated for a decline in offensive rebound rate and an increase in turnover rate. The team's turnover rate, though far higher than last season's, has improved significantly over the last two-and-a-half weeks. The Hawks have been slightly better defensively (so far) this season. The changes are less dramatic than cumulative. Opponents are missing slightly more shots and the Hawks are rebounding slightly more of those misses. Most importantly, the Hawks haven't seen a spike in their opponents' free throw rate despite their opponents making 78% (league average (76.5%) of their free throws this season compared with 74.5% (league average: 75.9%) last season. Premature conclusions: the Hawks are 1.6 points per 100 possessions to the worse so far this season compared to last but are, as expected, a fundamentally similar team. The Spanish-language joint venture between Univision and NBA.com features a bilingual blog from Al Horford. Spanish speakers, enjoy. Me, I'll have to wait for NBA.com and TV5MONDE to get together to publish Pape Sy's blog. 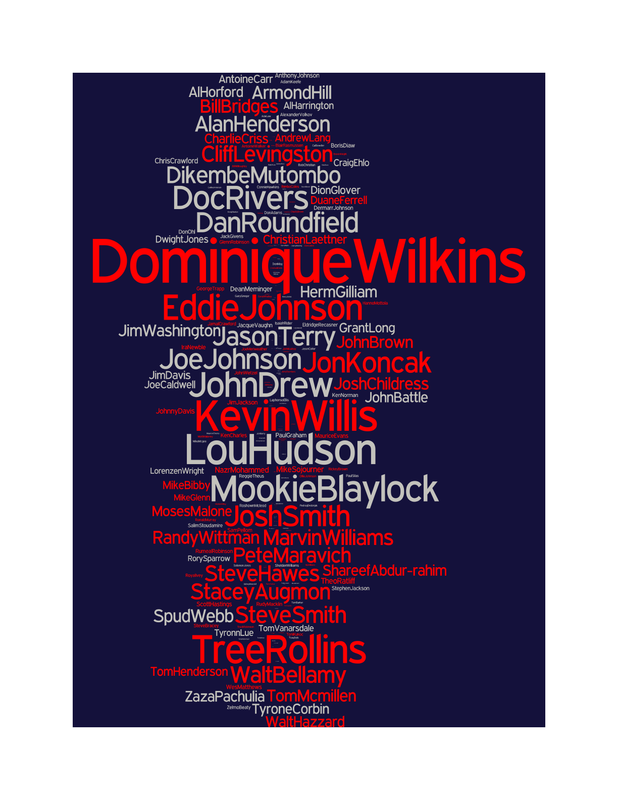 Hoopism created a word cloud for each NBA team based on minutes played. "DeMar (DeRozan) got outplayed by Joe Johnson. Jose (Calderon) got outplayed by Mike Bibby. Andrea (Bargnani) got outplayed by Josh Smith. Sonny (Weems) got outplayed by Marvin Williams. Joey (Dorsey) got outplayed by Al Horford. I’m not picking on our starters for getting outplayed. Amir (Johnson) didn’t outplay anybody on their bench, either. Leandro (Barbosa) didn’t. They beat us, every single position, every single guy." "It just seemed like he was all over the floor. When he plays like that and plays under control, he is such a force. His defensive game, he was all over the place, rebounding the basketball, helping defensively and talking. Just a super overall game." All this despite Smith wasting six offensive possessions on jump shots. He made two of them. "When it was coming down to it, I was like 'Man, I'm not going to get it.' We ran a couple of plays for me to try and get the assist." "I was a little concerned with our energy, whether we would have our legs. We started the game with good intensity." "I am starting to get my confidence back in it. There are still some things that still bother me. Coach is doing a good job with slowing me down and letting me sit out in practice. I feel more explosive out there. When I first got it banged, I didn’t feel explosive at all. These last couple games I’ve been getting to the line because I feel more comfortable pushing off. I still feel pain but I am starting to feel better each day." "I think sometimes other people panic more than we do. We just can’t get too highs on the highs and too low on the lows. We started off 6-0, obviously we are going to hit some rough spots. The one thing about this team is we stay together." "What we have been doing these last three games is something special." Be sure to include the schedule-makers when passing at the rings to commemorate this 3-0 stretch against the Wizards, Knicks, and Raptors. "We knew that Amir was going to play the majority of minutes (and if) Amir picks up two fouls right away (as a starter), which he’s prone to do, then he has to sit out for the whole half and I can’t even get into rotations." That reasoning contains what the kids might call "lots of fail." I'm going to give the Bibster love because, as much as I like to give Horford nods for his industrious work, I love that when the Hawks want to free up Al, Joe, or Josh to go to the hoop, it's Mike that sets the hard screens to get them there. Though the lack of defensive resistance Toronto offers provided little in the way of useful perspective with which to evaluate the general level of quality the Hawks achieved Sunday afternoon, it did grant us a game-long look at how Larry Drew's offense is designed to work: constant movement of both players and the ball until someone, anyone gets an open look. The five starters plus Jamal Crawford each attempted between 8 and 13 field goals. Each of the six players earned at least one assist. The team scored frequently and early enough to allow Drew to limit the minutes of most of the core players. The Hawks can't make the Raptors provide a stern defensive test. They can only go out and execute or not. This afternoon, they executed. Toronto, assembled in such a way as to preclude the possibility of playing quality defense, should be far more concerned with their complete offensive capitulation in the third quarter. They scored 50 points on their first 46 possessions, a rate sufficient to compete in this game as well as almost exactly what one would expect given the season-to-date performances of both their offense and Atlanta's defense. Over the final 10:27 of the third quarter, they managed to make just one field goal, five free throws, and committed six turnovers. Offensive execution is not so easy as it seems. One thing that neither seems nor is easy is breaking into the Atlanta rotation as a young point guard. Jeff Teague again got pulled immediately after making a mistake. With 8:56 left in the second quarter, he made a lazy pass while initiating the offense. Leandro Barbosa stole the pass and took it in for a layup. It was a unforced error in every respect. It was also exactly like unforced turnovers Mike Bibby and Jamal Crawford have committed in recent games. Unlike Teague, they are allowed to play through* their mistakes. Also unlike Teague, neither Bibby nor Crawford figure to have any long-term impact on the fortunes of this franchise. Given the dire salary cap restrictions the Hawks will face until almost the middle of this decade, a rookie-scale contract should be like gold to this franchise but they appear completely willing neither to use Teague nor get anything useful for him. If he is so limited that the team** cannot overcome him committing a turnover or giving up a open shot, then sit him next Etan Thomas and give his spot in line to Jordan Crawford. Just as soon as Rick Sund explains why he took Teague ahead of DeJuan Blair and Darren Collison. It should be even more captivating as his explanation that the Hawks "play really well" when everything's working and they'd be a better team if they could play good defense. *Even Josh Powell, terrible now and disposable going forward, committed a turnover inbounding the basketball when the game was still within in six late in the second quarter. He finished the half and made his regular appearance in the third quarter. **A team, I remind you, whose backcourt defense consists of some combination of Mike Bibby, Jamal Crawford, and Joe Johnson. TORONTO INJURY REPORT: Ed Davis and Reggie Evans are out. PREVIOUSLY...the Toronto Raptors lost 110-101 in Boston on Friday night. The loss snapped a four-game Raptor winning streak. Toronto also lost Reggie Evans to a broken foot in the game. The absence of Evans, Toronto's leading rebounder on both ends of the floor, could limit the exposure of Atlanta's weakness on the defensive glass and the importance of offensive rebounding to their efficient scoring. Then again, if most of Evans's minutes go to Amir Johnson, Toronto may not miss a beat on the offensive glass. It's a big game for Atlanta's tenured guards as they should, for once, be only the second-worst set of perimeter defenders on the court. Marvin Williams should be well-rested after sitting for the final 15 minutes of yesterday's game despite delivering his best performance since returning from injury. "We've got to be mentally ready for these early games, and we weren't. We didn't come out from the start with energy, we had to fight so hard to get back into it, but the Hawks had the confidence and momentum, and it's hard to beat a team when they're feeling that good." "I had to be effective some way. I couldn’t make a damn shot. I just try to make up for it with defense, rebounding, getting guys shots. A lot of times they double me whether I am making shots or not. So I am just looking for open teammates." "They are being more aggressive on me and almost forcing me to make other players and pass it out. It’s just something I am going to have to adjust to. I’m unselfish enough that I am going to get the ball and kick it out quickly." "We blew some defensive assignments, which we didn’t do the first half. We had some breakdowns. Some baskets they got in the second half, we did a good job with in the first half. With Josh, we know we can have a breakdown and he will erase our mistakes." "We are helping each other now. We are having fun again, sharing the basketball, communicating. I think if we can put a string of games like that together, we can have a successful season." Give the Hawks credit, but I’ve got two caveats. One is that the Knicks and Wizards just aren’t good enough to cause Atlanta the kind of frustration that comes from playing its best but still having to be precise and persistent for long periods. The other is that there’s energy and effort but then there are the limitations of the roster and how L.D. uses what he’s got. "They are going to start every game at a high energy level. Thus far, it's been two games since we made that pact, and we've done it." I’ve snooped around and so far all I can gather is Teague’s reduced role is nothing more than coach’s decision. The decision, I might add, of a coach given a short bench and little in the way of organizational authority or job security. J.J.’s scoring struggles are becoming a big problem because now he’s wrecking Atlanta’s flow. There are times he’s just not in sync with what his teammates are doing and the ball stops when it gets to him, just like last season. It’s as if the more he struggles, the more he slows down his game as he thinks about what he can do to get a good shot instead of realizing he’d get plenty if he swung the ball around. Time to resurrect my theory that one of the reasons Johnson left Phoenix was that the way Steve Nash plays makes no sense to him? "It’s always fun to come back here." They cut the deficit to 4 points in the fourth quarter, then faded as Jamal Crawford, a former Knick, scored 10 points in a 21-8 Hawks run. Crawford, who was traded two Novembers ago when the Knicks began purging salary, scored 21 points off the bench for the Hawks. Crawford put on a familiar show, hitting tough fadeaways, off-balance runners and clutch 3-pointers. A Knicks-Crawford reunion is possible. Crawford is due to become a free agent next summer, and the Hawks have been hesitant about offering an extension. The Knicks will have cap room again when Eddy Curry, Crawford’s close friend, comes off the books, and. Their primary target will be Carmelo Anthony. But they have a clear need at shooting guard. “I would definitely listen,” Crawford said. Was that the passing of the guard we witnessed in the fourth quarter? An on-court acknowledgment of whose hands hold the future of franchise regardless of the allocation financial resorces? Joe Johnson isn't in a shooting slump. Joe Johnson can't create good shots for himself and he's either incapable of or unwilling to move the ball quickly in the half-court offense. Some hot jump shooting from his teammates overcame this personal failure in the first quarter as the Hawks took control of the game and some good work on the offensive glass from Mo Evans and Al Horford held off both the Knicks and the inadequacies of isolation basketball as practiced by an inefficient scorer in the late third and early fourth quarter . Larry Drew then largely took the ball out of his highest paid player's hands and made Al Horford, the team's best player, central to almost every offensive possession from the 10-minute to the 3-minute mark of the fourth quarter. Horford scored eight points, grabbed two offensive rebounds, and earned two assists in the fourth quarter. He set countless ball-screens to free ball-handlers. He made strong, purposeful cuts to create space for himself or his teammates. He scored in the post. He drew, then passed out of, a double-team in the post. Neither Horford nor the ball rested in the heart of the fourth quarter as the Hawks finished off the Knicks. Not that Horford papered over all the team's inadequacies. Jamal Crawford is by far the Atlanta guard most adept at running screen-and-roll or pick-and-pop with Horford but he had to share the ball-handling opportunities with Joe Johnson and Mike Bibby. Johnson moves laterally across the floor, rather than turn the corner and attack, when using a ball-screen and, as mentioned above, does nothing quickly. Mike Bibby has to play at the very limit of control both to turn the corner and to hit Horford on the move. Crawford, though, is given the freedom to take advantage of his one great skill within a team context. It's the latter that helps minimize Crawford's offensive weaknesses. Running the screen-and-roll with Horford gives Crawford two options: take the first available shot or pass the ball to Horford. He doesn't have to move without the ball. He doesn't have to anticipate what his teammates will do. He doesn't have to work through the full set of options available to a point guard. Furthermore, the difficulty he and Horford cause defenses opens up offensive rebounding avenues should Crawford choose to take a bad shot. Crawford scored 10 points while making 4 of 6 shots (not counting his shot-clock violation avoidance heave with 5 seconds left in the game). One of those misses was rebounded and put back by Horford. The Hawks also witnessed the value of the symbiotic defensive relationship between Horford and Josh Smith as Smith sat much of the second half due to (real) foul trouble. Horford, playing alongside Marvin Williams, or Zaza Pachulia, or four guards had responsibility both for Amar'e Stoudemire and cleaning up after whichever Knick guards penetrated the first line of Atlanta defense. 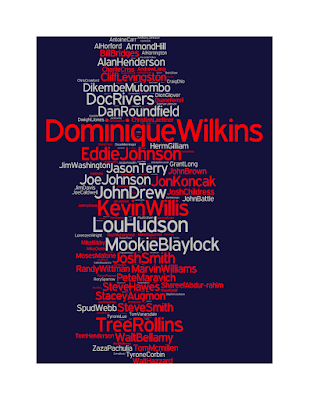 There is no most important Atlanta defender, there is only the importance, the necessity, of Smith and Horford. Add in the first, simultaneous evidence of good health from Mo Evans (10 points on 9 shots in 25:24) and Marvin Williams (13 points on 7 shots, 8 rebounds, 3 of them on the offensive end, and...THIS) and the outlook appears far brighter than it did earlier in the week. Just the Wizards? Sure, but keep in mind the Hawks haven't blown out a lesser team since opening night. If there are particulars that temper one's excitement over the comprehensive victory (Al Horford getting the majority of his shots (6 of 11) and points (9 of 15) off of the offensive glass, Josh Smith's fondness for the long two-point jumper, whatever's going on with Jeff Teague's minutes) then one also has to acknowledge, for the sake of fairness, the atypically fine job the Hawks did of bottling up John Wall and Gilbert Arenas (exactly the sort of two-headed, off-the-dribble guard attack that has bedeviled the Hawks for years) and getting the perimeter players involved in the defensive rebounding effort. If that sort of defensive performance* on the perimeter can be replicated against better teams, teams not playing on the road on a holiday evening, then the dream of 50 wins is not dead. *Note the extremely intentional choice not to use the word "effort." The Hawks have never failed to understand how they play their best, they just struggle to achieve that level of performance. One, because it's difficult to do. Two, because their opponents just as clearly understand how the Hawks play their best and try to thwart them. Three, because their lack of depth, both in numbers and in the number of well-rounded players, limits their margin for error. Firing on all cylinders, this is a team to behold. It's a sight for sore eyes at this point in time but let's not fail to appreciate the degree of difficulty involved in a good performance regardless of the quality of the opponent. Less encouraging were the immediate lessons some of the players and head coach took from the victory. "They had to bring energy. That was the most important thing. It wasn’t about the game plan. It wasn’t about our strategy. The first line of business was to bring energy. That type energy I saw today I had not seen for a few games, especially from start to finish." "We really did bring the energy and the effort tonight. We were able to bring it at both ends of the court. We were just helping each other out and having fun." "We only put up one word on the board: 'Energy.' I think we fulfilled that. Everybody played with a lot of intensity, a lot of energy, and we played together for the first time in a long time." "The big emphasis was blocking out. McGee had been playing so well coming into this game. We held him off as best we could. I think our guards played a huge role coming in and making sure they helped out with the long rebounds." "We made it a point to make sure we shadow wall and have a big guy somewhere in the vicinity and keep him from getting into the gaps. But then we have to defend the 3-point line with Gilbert and Nick Young and I think we did a good job of that." "I thought Joe looked like the Joe of old. Just watching the ball come off his release, it had the rotation on it. He wasn’t hesitating. Hopefully he can sustain that and keep looking for his shot." I don't think anyone need worry about that. I appreciated that, except for a couple of instances, he was committed to keeping the ball moving. And it was good to see him hit open shots, too. Funny how the percentages start going up when the ball starts moving around. Sebastian Pruiti breaks down a nifty flex set the Hawks used to get Josh Smith open in the lane last night. This one also features a key Mike Bibby screen. Don't let the final rebounding margin of 49-38 fool you because it wasn't that close. Washington racked up some offensive boards in garbage time to help trim that gap. In reality this Hawks team controlled the glass from the outset and raced off to the tune of 16 first quarter fast break points. When the Hawks are rebounding the basketball they can score in transition even when they are not necessarily looking to. Al Horford and Josh Smith combined to grab 27 of those 49 rebounds but make no mistake that it was a collective effort on the boards with even the likes of Mike Bibby and Jamal Crawford throwing their bodies into Wizards players in an attempt to block out. On their own, Andray Blatche and JaVale McGee are a subpar defensive rebounding duo (though McGee has made great strides here). Neither guy really knows how to box out well, and while McGee makes up for it with tremendous athleticism, there's a distinct lack of meat-and-potatoes play necessary to control your defensive glass. But when you go zone, it makes the problem worse. The bigs are now responsible for an area, not a man, which makes it even more difficult to box out. You're also forcing those two to step up and contest shots from the short corner and the high post, both holes in any zone defense. That leaves the basket area uncovered, and while a guard is supposed to rotate down, he has no chance boxing out guys like Al Horford and Josh Smith. WASHINGTON INJURY REPORT: Josh Howard is out. Al Thornton and Yi Jianlian are questionable. PREVIOUSLY...the Washington Wizards (for the second time this young season) beat the Philadelphia 76ers in overtime Tuesday night. It was the first game back for John Wall after missing 4 games with a left foot sprain. He came of the bench to score 25 points and earn 6 assists. Wall's NBA career got off to a quick start thanks to his 28-point, 9-assist game against the Hawks on October 30th. The Hawks won a tight contest 99-95. The same subject, two weeks hence. Smith's hot start (8-20) from beyond the arc has lifted his career 3PTFG% to 27.1%. Smith is also making a significantly higher percentage of his long two-point jump shots so far this season. So he's both taking and making a greater percentage of his long jump shots so far this season, though not at the rate (48.3%) he was two weeks ago. Smith has slightly reduced the frequency of his jump shots as he's begun to regress toward his career norms. Not coincidentally, his scoring rate has picked up and is, season-to-date, the second-highest of his career, this despite a diminished free throw rate (27.0 for his career entering the season, 20.1 so far in 2010-11). That free throw rate itself diminished despite an encouraging start (70.4 FT%) to Smith's season from the line. Unsurprisingly, Smith has been devastatingly effective at the rim. When they share the court, Jamal Crawford and Mike Bibby are redundant. Their offensive strengths overlap and they don't play especially well together. They shared the court for over 19 minutes against the Nets. Bibby didn't score a single point in that time and Crawford scored just 8 of his 21 points alongside Bibby. He scored his other 13 points in the 18 minutes Bibby wasn't on the court alongside him. Defensively, they're two of the worst perimeter players in the league. Bibby is ineffective but is generally where he needs to be. More importantly, Bibby is where his teammates expect him to be. Crawford is completely unpredictable in how he'll screw up defensive rotations which, combined with his abysmal defensive rebounding, puts tremendous stress on his teammates. Except for the final defensive possession of regulation (when Marvin Williams replaced Bibby) and the final 19 seconds of overtime (when Jeff Teague replaced Bibby) Crawford and Bibby shared the court for the final 13 minutes and 10 seconds of the game. It did not work. Bibby didn't attempt a single shot, earned one assist, and grabbed two defensive rebounds in that time. Crawford scored 10 points in the fourth quarter and overtime, on just 5 shots, but he turned the ball over twice and was a big part of why Devin Harris had 10 points (on 6 shots) and earned 3 assists while Anthony Morrow added 11 points (on 4 shots) in the fourth quarter and overtime. It's very difficult to get a sufficient number of stops when you play a point guard and a lead guard so poor defensively that you have to put your biggest guard, himself a sub-par defender, on the opposing team's quickest player and primary ball-handler down the stretch. Perhaps, if Marvin Williams or Jeff Teague spent more than the final defensive seconds of the game on the court the game wouldn't have come down to the final seconds. Both played well, if far from spectacularly. Williams keyed a nice team defensive stretch* early in the second quarter, playing the point on a matchup zone. Williams knocked down a three-pointer to pull the Hawks within 1 with 1:39 left in the third quarter. He was substituted 27 seconds later and didn't play another offensive possession. Teague was far more successful in his first half stint, scoring both his points, earning both his assists, and twice picking New Jersey pockets than in his second half stint where he committed two turnovers. *The Hawks were within two points when he left the game at the 6:58 mark of the second quarter. They were down eight when he re-appeared at the start of the second half. The frontcourt rotations weren't appreciably better for the Hawks. The Horford Treatment reappeared and it brought with it the Pachulia Corollary. Horford picked up his second personal foul with 4:11 left in the first half and the Hawks down two. Since Pachulia (who would play just 10 minutes and 46 seconds in the game) already had two fouls, in lumbered Jason Collins who got to foul Kris Humphries twice, got to watch Brook Lopez score two quick buckets, and stood there while both Humphries and Lopez grabbed an offensive rebound. An action-packed four minutes (including a defensive rebound, bringing his DR% back over 8.0 and inching ahead of Mike Bibby's) for the bulky lynchpin. When he left the game, the Hawks were down eight. Horford, of course, finished regulation with three personal fouls and the overtime period with five personal fouls so Larry Drew effectively fouled out his best player four minutes early. Not that the Hawks exhibited any indication of who their best player was when Horford played. Unlike the Nets, who took a page out of Boston's Monday night book, quickly and frequently got the ball to Brook Lopez in positions where his size was an advantage over Horford, the Hawks ignored their leading and most efficient scorer for much of the opening period. Horford had three touches in the 9 minutes and 5 seconds he played in the first quarter. The Hawks scored 5 of their 21 first quarter points as a result of those rare instances of involving Horford. Here's what an off-night for Horford looks like: 14 points on 11 shots, 10 rebounds (3 offensive), 5 assists, and 1 turnover. Here's what an increasingly typical* night looks like for franchise player Joe Johnson: 16 points on 18 shots (0 points on 4 shots in overtime), 8 assists, 6 rebounds (1 offensive), and 2 turnovers. Neither acquitted themselves especially well defensively, though it should be noted that Brook Lopez scored 8 of his 32 points and grabbed 2 of his 4 offensive rebounds in the nine minutes he was not sharing the court with Horford and Joe Johnson was, ridiculously and hopelessly, asked to stay in front of Devin Harris. *Johnson's True Shooting Percentage is now 49.8% on the season. And he still comfortably leads the team in usage rate. And no combination of injury and ineffectiveness will limit his playing time. Twice it appeared as if Josh Smith's playing time was tied to his shot selection (9-21 from the floor, 1-6 from outside 16 feet, no jump shots after he was pulled from the game four minutes into the second half), a coaching decision many could get behind, one even more could get behind were it not tied to Josh Powell's minutes. Even on a night when Powell played well by his standards: 6 points on 6 shots, 4 rebounds (1 offensive), and no turnovers in 18:47, he was far less productive than the historically superior Pachulia: 4 points on 4 shots, 6 rebounds (3 offensive), 2 assists, and no turnovers in 10:46. In a game that's tied after 48 minutes, do you really want to look back and wish you'd played your better players more? That you'd built your offense around your best player? "We just have to keep working. We can’t feel sorry for ourselves. Throughout the season you are going to have ups and downs. You have to learn how to handle adversity and it makes you stronger." You also have to learn how not to create your own adversity. "The effort was there. It just didn’t go our way. We expended so much energy getting back in the game we didn’t have enough to finish." This is what effort gets you: a narrow loss in New Jersey. Talent remains king and defense remains a talent. "You lose some games. You can’t win all 82. We’ve got a lot of games left. We can’t get down." The Hawks went retro with some Iso-Joe and Jamal. It was a mixed bag. They rallied behind a combined 14 points on 5 of 6 shooting from those two in the fourth quarter. But costly turnovers by both cost them possessions when the game was there to be taken late in regulation. The Hawks scrapped the new motion/flex offense in favor of a handoff heavy isolation offense featuring the two players that have been struggling the most offensively: Joe Johnson and Jamal Crawford. So gone were the open looks that Al Horford would get out of the flex. Not a single Joe Johnson cutting to the hoop to get a pass from Horford with Bibby setting the back screen. Nope, we got Horford hunched over with his back to the basket, straining to handoff to his outside shooting overlords and a series of what Nique always calls "tough shots" for the backcourt. NEW JERSEY INJURY REPORT: Quinton Ross is out. PREVIOUSLY...the New Jersey Nets lost 107-103 in Denver on Saturday, wrapping up a four-game West Coast road trip on which they went 1-3. Though the Nets are only 4-9 on the season, they've played 7 of their 13 games on the road (where they're 2-5) and have faced both Orlando and Miami twice, going 0-4 in those meetings while the Hawks were getting two cracks at the Timberwolves. Take a peek at Wayne Winston's power rankings through yesterday's games and you'll see why the Hawks could have worries beyond Devin Harris tonight. "This was very, very embarrassing. If I had to sum it up in one word: embarrassing. To come out with that type energy; that type urgency. What I see with our team right now I don’t feel real good about. I am disappointed that we are not playing with a hunger. We are looking to point fingers. We are playing the blame game. More importantly, our energy level is not good at all. We are not doing things quick, we are not doing things with speed, we are not doing things with urgency. We are playing like we are coming off a back-to-back-to-back. I told the guys I don’t know what you are doing the night before we play, I don’t know what you are doing away from the floor. Something is going on that is not allowing us to play with an energy and passion that we should be playing with. As a head coach, I’ve got to find out what it is. Something is going on and I’ve got to get to the bottom of it. Players have to know themselves. They have to know their bodies. They have to know how to get physically and mentally ready for every game, especially at the start. First four minutes of the game, when I see my players bending over grabbing their shorts because they are winded, something is going on. Something is wrong." "I don’t think we are [accountable]. We tend to have excuses for everything." "The Celtics know who they are. We don’t have an identity, unless it’s when things go bad we go the other way. Maybe that’s out identity and we don’t know it." "I never would have thought we would come out so not ready to play. They remember we swept them last season. They wanted to come in and send a message and they did it." Come out not ready to play? The Hawks? "Guys have got to understand you can’t be sensitive to policing." *If you didn't laugh, you'd cry. The scene was eerily similar to the aftermath of the Orlando series. Bickering players, poor body language, lack of resolve and booing fans during the game. Quiet locker room and questions about character after it. "Teams think we’re [soft] after losing the last two games, and with a team that beat us four times, it’s sort of like a statement game really. This may be a team we play in the playoffs. The regular season is a time when you can take away a lot of confidence from a team if you play and beat them the right way." In the midst of criticizing the Hawks players for their effort, let's also take a moment to acknowledge that Paul Pierce, in his post-game comments, exemplified a longer-term perspective than anyone in management has for the Atlanta Hawks in memory. The dysfunction is deeply entrenched in the organization. "Before the game I don’t even think I said the word ‘offense’. Our defensive disposition from the start was terrific. I felt that we were going to compete defensively, but the big question is, can we do this every night? We’re a veteran team and sometimes it seems like we’re counting how many games we have until the playoffs." "He’s our defensive leader. Tonight he showed it. He was aggressive. Pick-and-roll defense is the biggest thing for us and I thought he did a great job of clogging the lane, making other guys take shots other than their stars." I think it's telling that the other team is always the one who makes specific defensive references in their post-game comments. I don’t want to ignore Kevin Garnett’s performance against Josh Smith tonight. Weirdly, Garnett started the game on offense as clumsily as he left off yesterday’s, just much luckier: he threw one transition pass away, fired an entry pass into the rim that Shaq somehow gathered and stuffed, and banked in a hook shot off his outer hip to set up a three-point play. But then Smith came down with mono or something. For much of the early game, it wasn’t that Smith couldn’t find a good shot, it was that his teammates couldn’t find him. And he did the absolute bare minimum to stop KG, someone Smith regularly frustrated last year, on the offensive end. Smith and Joe Johnson sometimes play like they’re trying to punish their crappy home crowd, and it kind of seems like that’s what happened tonight. KG was great and all, but he may not have been as great as Josh Smith was bored. NOTE: Those Boston totals include the effects of their 14-point, 7-turnover, 23-possession fourth quarter and thus flatter the Hawks. There are nights when analysis fails, when the better team plays so well and the lesser team plays so poorly that nothing about either is truly learned. Suffice to say the Hawks attempted 17 field goals (they made four) in the first quarter. Two of those attempts were in the paint. Three more were attempted within 15 feet of the basket. On the other end of the court, the Celtics missed just six shots and rebounded four of those misses in the first quarter. Hence Boston's 39-13 lead after 12 minutes. further suggests that effortThe combination of poor initial defense, poor defensive rebounding, and jump shots aplenty confirmed every fear one could have about this Hawks team before the season. At least four times in the first six minutes, Boston got a dunk or put-back when Al Horford was literally the only Hawk in the defensive paint. Yes, I generally reject the argument that better defensive effort is the solution to Atlanta's defensive shortcomings but the visible lack of defensive effort tonight is what keeps the Hawks a below-average rather than a terrible defensive team. There's little question that effort is also a big part of Atlanta's typical offensive success. One would be hard pressed to identify much in the way of (constructive) effort on that end of the floor for the Hawks, either. Josh Smith took just three shots (two of them outside of 20 feet) in 22 minutes. Joe Johnson was 0-4 in the paint and got to the free throw line just once. Jamal Crawford took just six shots in 31 minutes. The Hawks attacked Shaquille O'Neal, pick-and-roll defender, less than any team in memory, limiting the team's best offensive player so far this season to shooting face-up jumpers. Jeff Teague and Jordan Crawford showed a little life in the second quarter. They combined to score 9 of Atlanta's first 23 points and made an effort defensively both before and after Boston got a shot up. It was almost certainly too little, too late but it didn't last long either. As soon as the Boston lead got under 20, with just over seven-and-a-half minutes left in the first half, Mike Bibby and Joe Johnson were back in the game and the Celtics scored on consecutive possessions with the second bucket coming on a Nate Robinson offensive rebound. For whatever reason, Teague played just 2:27 of the second half despite the entire half being essentially garbage time. Teague came out after Nate Robinson made consecutive three-pointers in front of the Atlanta bench but Drew couldn't have pulled Teague to make a point about perimeter defense, could he? The entire Atlanta careers of Bibby and Jamal Crawford (not to mention much of Joe Johnson's) exemplify a pattern of non-accountability for the defense from the guards. Teague has had two head coaches in Atlanta, neither of whom have demonstrated the slightest confidence in any part of his game. Maybe that's warranted but, from the outside, it seems a penny-wise, pound-foolish decision to make an example of Teague on this night when he was absolutely the least of Atlanta's problems and lends further credence to the idea that there's almost no limit to how poorly the tenured guards can play without their playing time being reduced. BOSTON INJURY REPORT: Rajon Rondo is "highly doubtful." Kendrick Perkins and Jermaine O'Neal are out. PREVIOUSLY...the Boston Celtics have lost two straight: 89-84 at home against the Kevin Durant-less Oklahoma City Thunder on Friday and 102-101 in Toronto yesterday afternoon. Nate Robinson started in Rajon Rondo's absence in the latter loss. Robinson is expected to do the same tonight. Allow me to recommend the January 1, 2010 game tape for a reminder of how not to defend Robinson.